It's safe to say that, at least as far as automotive companies go, Audi's Sport Quattro Laserlight concept car is stealing the show here at CES in Las Vegas. The car's 700-horsepower hybrid powertrain and carbon-fiber bodywork mean that it would go like stink if it were ever allowed to turn a wheel, and the shapely coupe stance looks every inch the part of a modern-day super coupe, too. 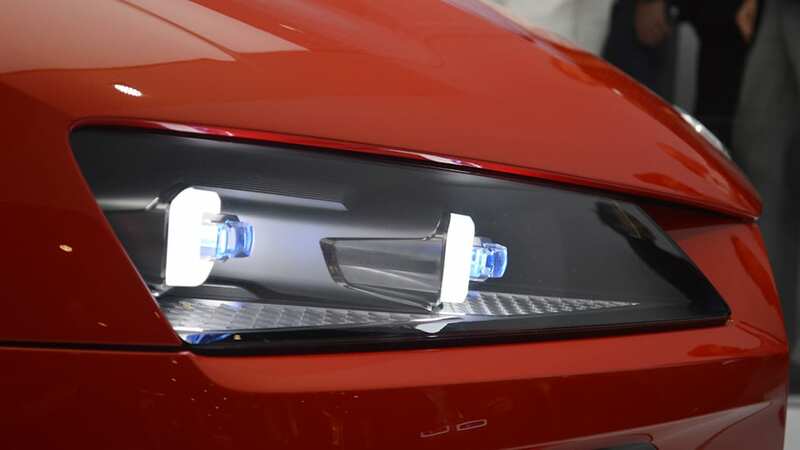 Better yet, the laser-powered headlamps that are the crowning glory of the concept car are actually slated for production at some point in the not-distant future. We're talking about lasers here, folks. I don't know about you, but if you had told the 10-year-old, Real Genius-watching version of me that there'd one day be a car with lasers for headlights, well, I'd have wanted one of those things, pretty bad. Anyway, Audi's lasers may not be able to ignite a giant pack of Jiffy Pop from space, but they are set to be the new standard for illumination on the road. The laser lights are nearly three times as bright and beam twice as far as current, top-notch LED high beams and were called "safer, sharper and more efficient" compared with existing technologies. That "safer" part works on two levels: the brighter beams offer far better visibility, naturally, but Audi also tells us that they won't dazzle oncoming drivers like traditional high beams will. That means you can drive with the maximum illumination at all times. Cool stuff, here at CES. Check out a gallery of the Audi Sport Quattro Laserlight in our attached gallery above, or re-read the official press release below. - Prof. Dr. Ulrich Hackenberg, Member of the Board of AUDI AG, Technical Development: "This show car embodies our engineering competence and shows cutting-edge electronic features such as high-performance laser-light headlights." Dynamic design, immense power and new electronic features: Audi is presenting a fascinating technology concept car at the Consumer Electronics Show (CES) from January 6 to 10, 2014 in Las Vegas, USA. 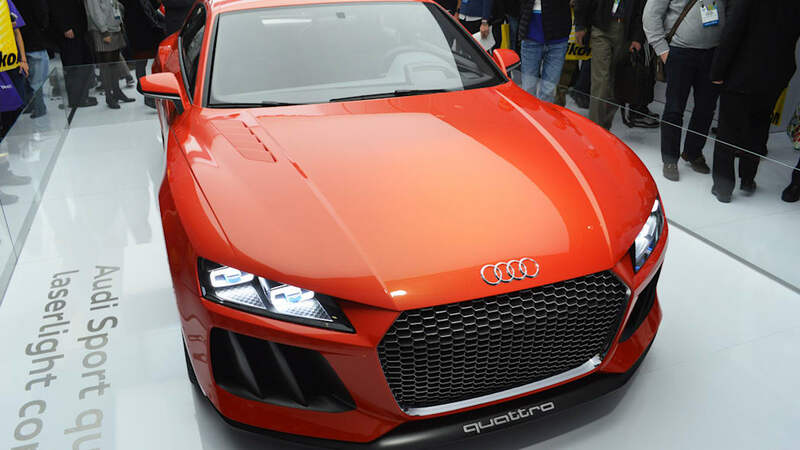 The Audi Sport quattro laserlight concept is reminiscent of the classic Sport quattro of 1983 while pointing towards the future – with the latest of the brand's technologies in plug-in hybrid drives, user control and display interfaces and lighting technology. 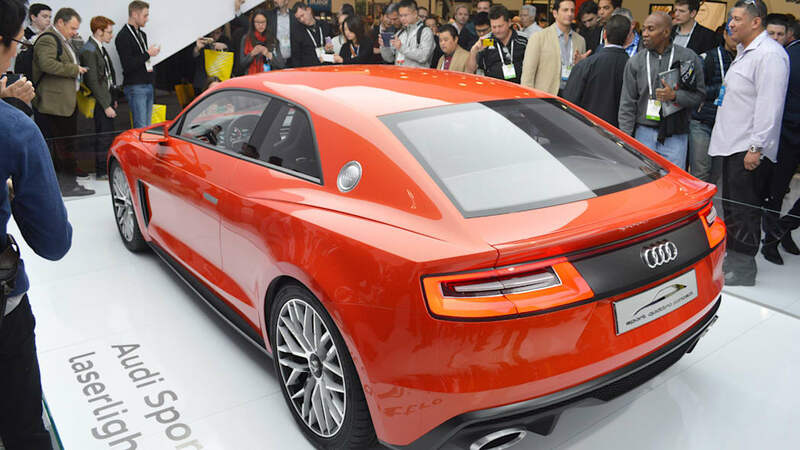 "The new show car demonstrates technical 'Vorsprung' on many levels," says Prof. Dr. Ulrich Hackenberg. "On-board this car we have e-tron technology with 515 kW of power and 2.5 l/100 km (94.09 US mpg) fuel economy; laser headlights that leave all previous systems in the dark with its higher performance as well as new display and operating systems with cutting-edge electronic performance. We are showing the future of Audi here." 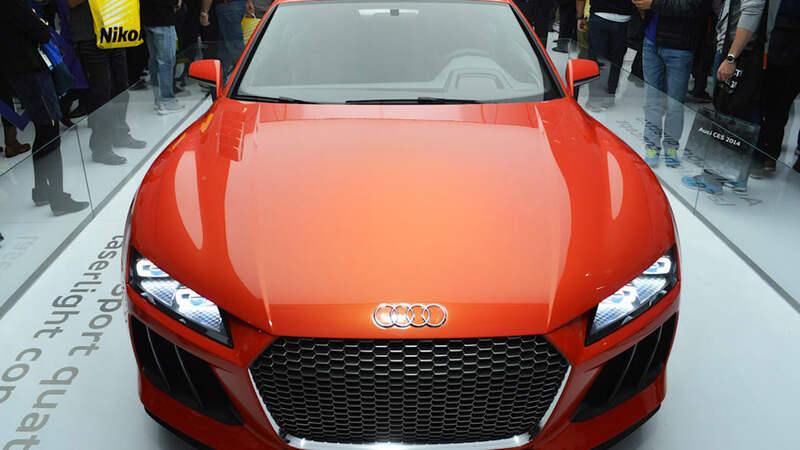 The coupe, a new evolutionary stage of the Sport quattro concept, painted in the color Plasma Red, combines the power of the historic Sport quattro with emotional elegance. Its body is tautly set over its large wheels. The overhangs are short, and the car's proportions show a sporty balance. With a wheelbase of 2,784 mm (109.61 in), it is 4,602 mm (181.18 in) long. At a width of 1,964 mm (77.32 in), the two-door model is very wide, and it is just 1,386 mm (54.57 in) tall, which is exceptionally low. 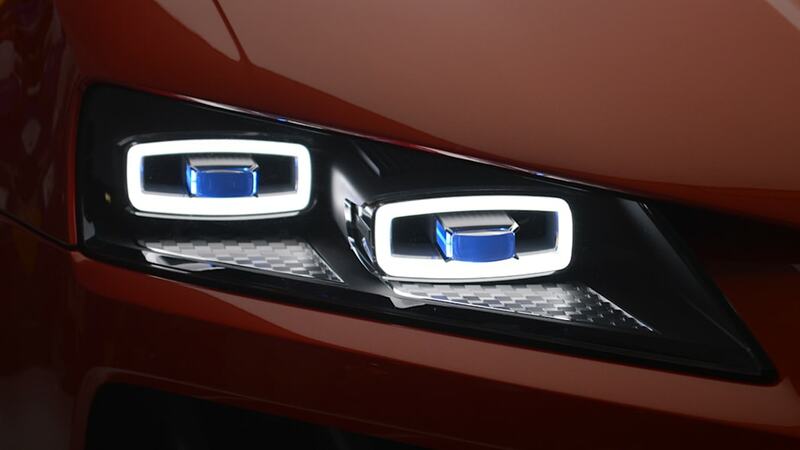 In the dual headlights, a typical quattro feature, Audi is demonstrating the future of lighting technology by combining matrix LED and laser light technologies. Two low-profile trapezoidal elements are visible within the headlights – the outer one generates the low beam light using matrix LEDs and an aperture mask, while the inner element produces laser light for high-beam functionality. The powerful laser diodes are significantly smaller than LED diodes; they are only a few microns in diameter. Illuminating the road for a distance of nearly 500 meters (1,640 ft), the laser high-beam light has approximately twice the lighting range and three times the luminosity of LED high beam lights. In this future technology, Audi is once again demonstrating its leadership role in automotive lighting technology with a system that will also be used on the race track in the 2014 R18 e-tron quattro. 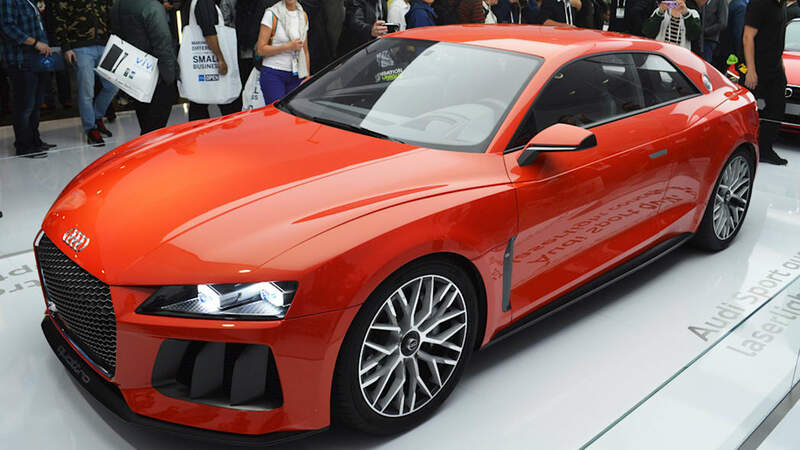 The angular, swept-back C pillars of the Audi Sport quattro laserlight concept car and the blisters above the fenders are other design elements reminiscent of the classic Sport quattro. The broad shoulders of the body were reinterpreted and intensively sculpted to convey even greater dynamism. Throughout the car, sharp contours frame muscular surfaces – the interplay between convex and concave curvatures defines the athletic character of the coupe. The hexagonal single-frame grille also offers an outlook on future design of the sporty production models. The lower section is nearly vertical, while the upper follows the contour of the hood; the screen insert is a typical solution from car racing. 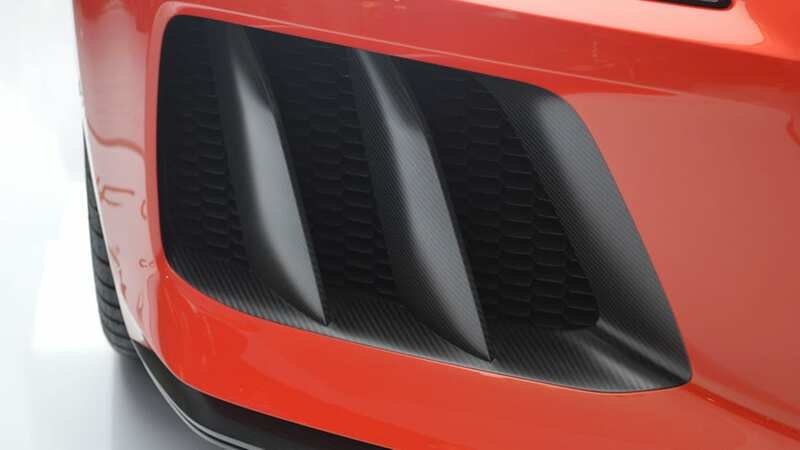 The low grille emphasizes the show car's width. 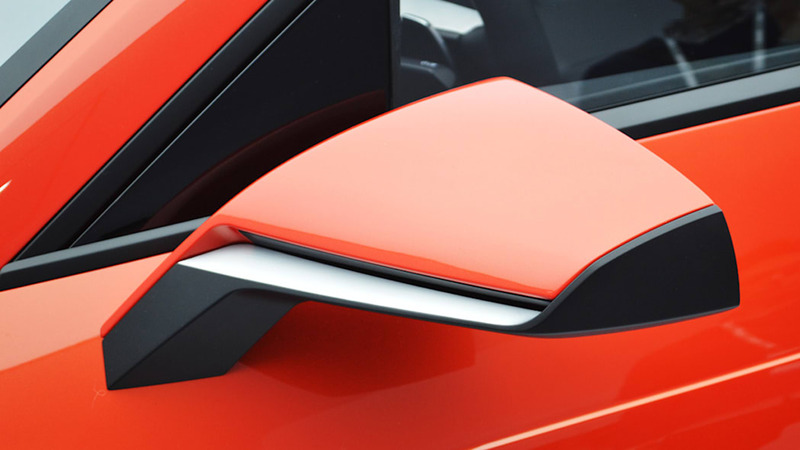 Two large, vertical blades divide each of the large air inlets; their form is repeated in the creases of the hood. The splitter, which is made of carbon fiber reinforced polymer (CFRP), is shifted far to the front, as on a race car. The combination of a swept-back glass cabin and broad shoulders defines the proportions at the rear. 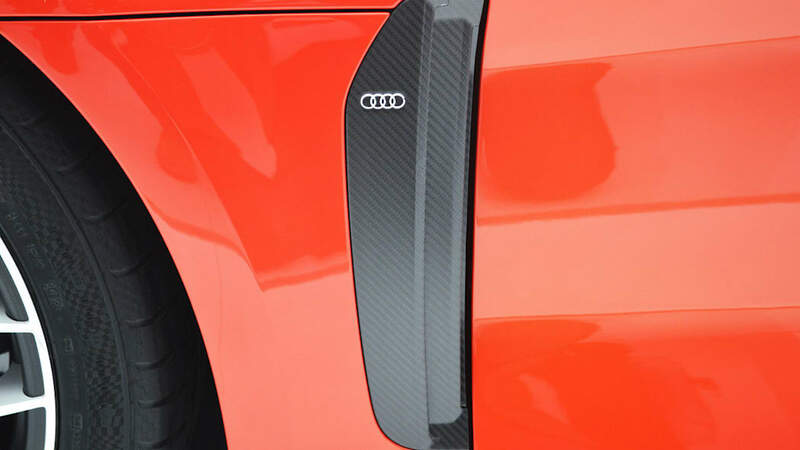 Another defining element at the rear of the show car is the CFRP diffuser, which extends upward significantly. 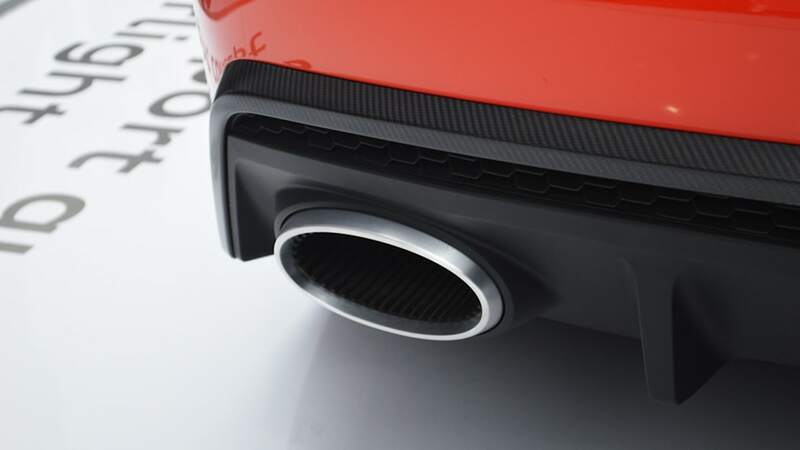 Its upper section is honeycombed, while its lower section houses two large, oval tailpipes. 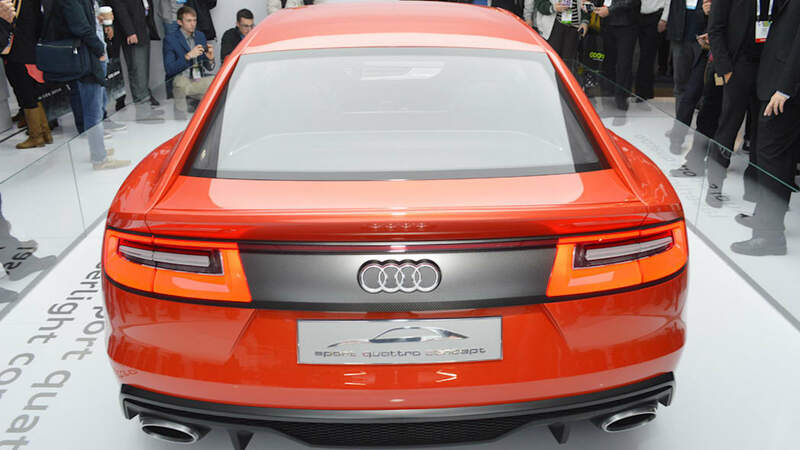 The tail lights, which are backed by a black CFRP panel, are rectangular in form – another quattro reference. The luggage space, which is reinforced by a large cross bar stiffener, offers 300 liters (10.59 cu ft) of cargo capacity. 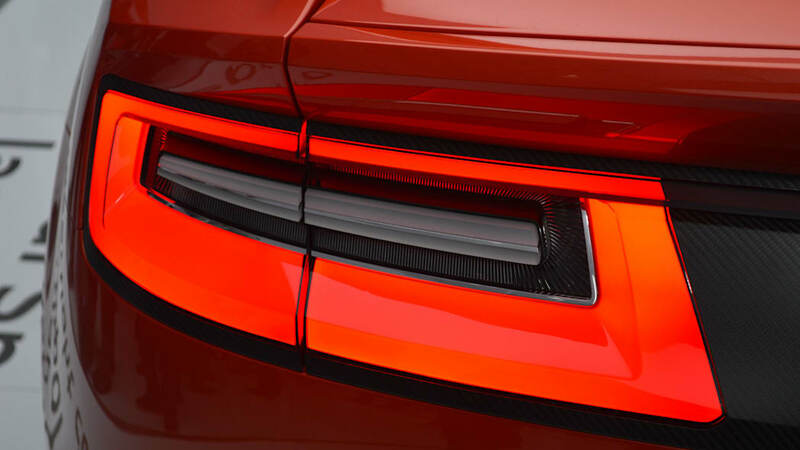 Precise design details round out the dynamic look of the Audi Sport quattro laserlight concept. The sill extensions are made of CFRP, the door handles electrically extend from the door when they detect the approach of a hand. The center locking wheels have a five twin-spoke design. In its generously cut interior, the elegant sporty styling of the show car is continued with dark gray colors and clean lines. The interior design and material selections demonstrate the Audi philosophy of lightweight design. The slender instrument panel is reminiscent of the wing of a sailplane. The supporting structure of the interior is a carbon shell that also serves as a storage compartment in the doors. 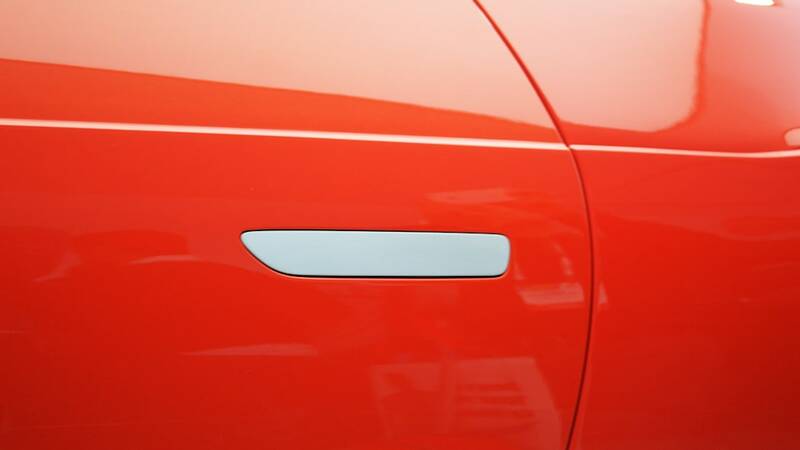 A line of trim beneath the windshield wraps around the driver and front passenger and integrates functions such as the inside door handles. The folding race car shell seats with their high lateral supports and integrated head restraints, together with the two rear seats, provide space for four persons. The climate controls are integrated in the air nozzles; a single element is used to control the intensity, temperature and volume of the air stream. In addition to showing climate control settings, the slim display at the centers of the air nozzles also shows media data. The interior of the Audi Sport quattro laserlight concept focuses very much on the driver. Even the multifunction sport steering wheel points the way towards future sporty production solutions. It has two buttons which the driver can use to control the hybrid drive, a red start-stop button, a button for the Audi drive select vehicle handling system and a "View" button to control the Audi virtual cockpit. All key information is shown on the large Audi TFT display in high-resolution, three-dimensional graphics; a cutting-edge Tegra 30 processor from Audi partner Nvidia processes the graphics. The driver can switch between different modes. For example, in the MMI mode the dominant display elements include the navigation map and media lists, while in the Classic view the speedometer appears in the foreground. 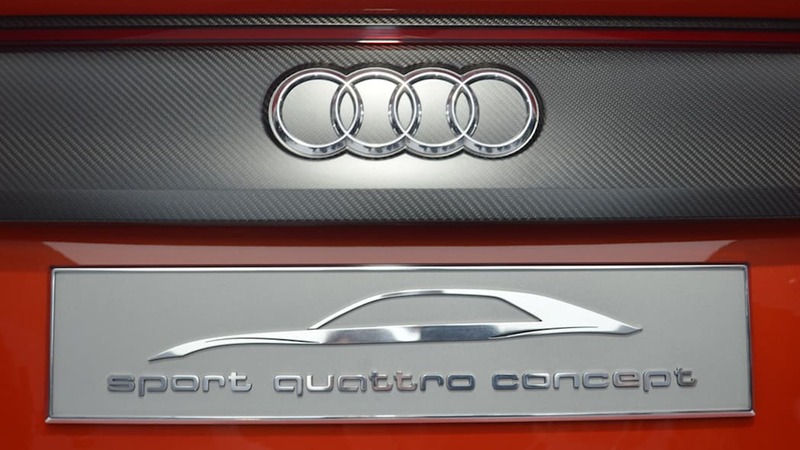 Nearly all functions of the Audi Sport quattro laserlight concept can be controlled from the further developed MMI terminal that is mounted on the center console over the tunnel. Its large rotary pushbutton, which also serves as a touchpad, can be pushed in four directions, and it is surrounded on three sides by four buttons – for the main menu, submenus, options and a back function. The new user interface has a menu structure whose intuitive layout is similar to that of a smart phone. All frequently used functions can be accessed lightning fast. For most inputs, just a few steps are needed thanks to a new free text search feature; generally just four characters suffice for a navigation address. The driver can quickly scroll through lists or zoom the map image using multitouch gestures on the touchpad. Voice control functionality has also been intensively further developed. The plug-in hybrid drive gives the Audi Sport quattro laserlight concept fascinating dynamic performance. Its system output is 515 kW (700 hp), and its system torque is 800 Nm (590.05 lb-ft). Power flows via a modified eight-speed tiptronic to the quattro drivetrain, which features a sport differential at the rear axle. The show car's combined fuel consumption, based on the applicable fuel economy standard, is just 2.5 liters of fuel per 100 km (94.09 US mpg) – which equates to CO2 emissions of 59 g/km (94.95 g/mile). The combustion engine is a four-liter V8 with biturbo charging; it produces 412 kW (560 hp) of power and 700 Nm (516.29 lb-ft) of torque. The cylinder on demand (COD) system, which deactivates four cylinders under part load and a start-stop system make the sonorous eight-cylinder engine very efficient. Located between the 4.0 TFSI and the transmission is a disc-shaped electric motor that produces 110 kW and 400 Nm (295.02 lb-ft). It draws its drive energy from a lithium-ion battery at the rear, which stores 14.1 kWh of energy – enough for up to 50 km (31.07 miles) of all-electric driving. 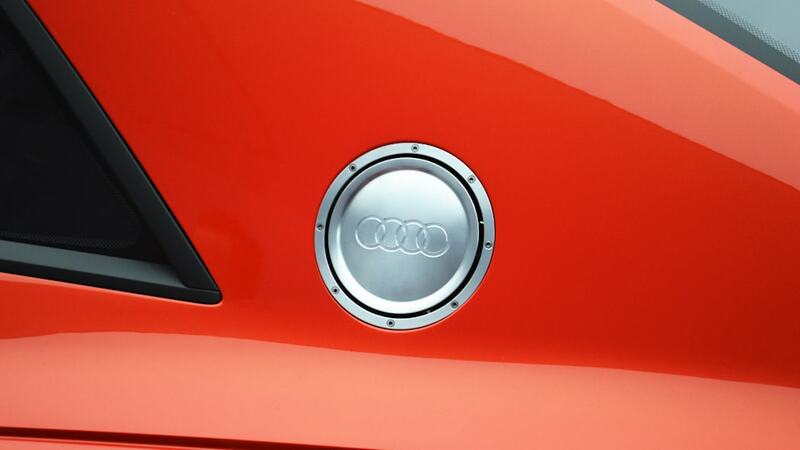 An Audi wallbox that is used for charging provides for optimal energy transfer. An intelligent management system controls the interplay of engine and motor on demand. The driver can switch between three different modes. In EV mode, just the electric motor operates; its high torque propels the show car with plenty of power – even outside of the city. The active accelerator pedal indicates the transition to Hybrid mode to the driver – by a change in pedal resistance; this is done so that the driver can intentionally influence the mode selection. The Hybrid mode aims at optimal fuel-savings in the interplay between the TFSI and the electric motor, and environmental and route data are utilized here. The driver can choose the Hold and Charge modes in the MMI to influence the operating strategy, e.g. if the driver wants to ensure that sufficient electrical energy is available for the final kilometers to the destination. The Audi drive select dynamic vehicle handling system offers even more control options – individual driving profiles are set up for different levels of regenerative braking. In Sport mode, the operating strategy configures the drive system for maximum power. When the V8 and electric motor are boosting, the Audi Sport quattro laserlight concept accelerates from a standstill to 100 km/h (62.14 mph) in 3.7 seconds and can reach a top speed of 305 km/h (189.52 mph). A lightweight design strategy also plays a major role in the car's dynamic performance. A combination of ultra high-strength steel sheet and structural elements of cast aluminum is used in the occupant cell. The doors and fenders are made of aluminum, and the roof, engine hood and rear hatch are made of CFRP. This results in an unladen weight of just 1,850 kilograms (4,078.55 lb), including the large battery pack. The front suspension is comprised of five links per wheel, while the rear suspension is based on the self-tracking trapezoidal link principle of Audi, which guarantees dynamic performance and stability. Stiff tuning of the springs and shock absorbers make the Audi Sport quattro laserlight concept hold tightly to the road, while Audi drive select makes the driving experience even more multifaceted. The dynamic steering system varies the steering ratio as a function of driving speed. 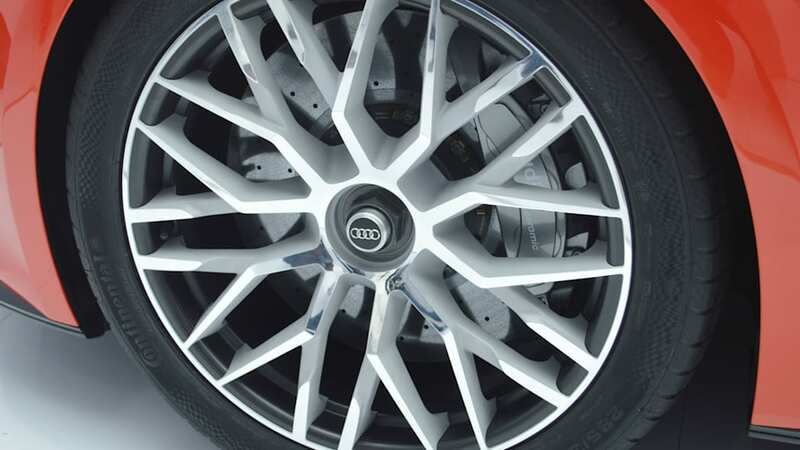 The brake calipers grip large, carbon fiber-ceramic brake discs, and the tire size is 285/30 R 21.